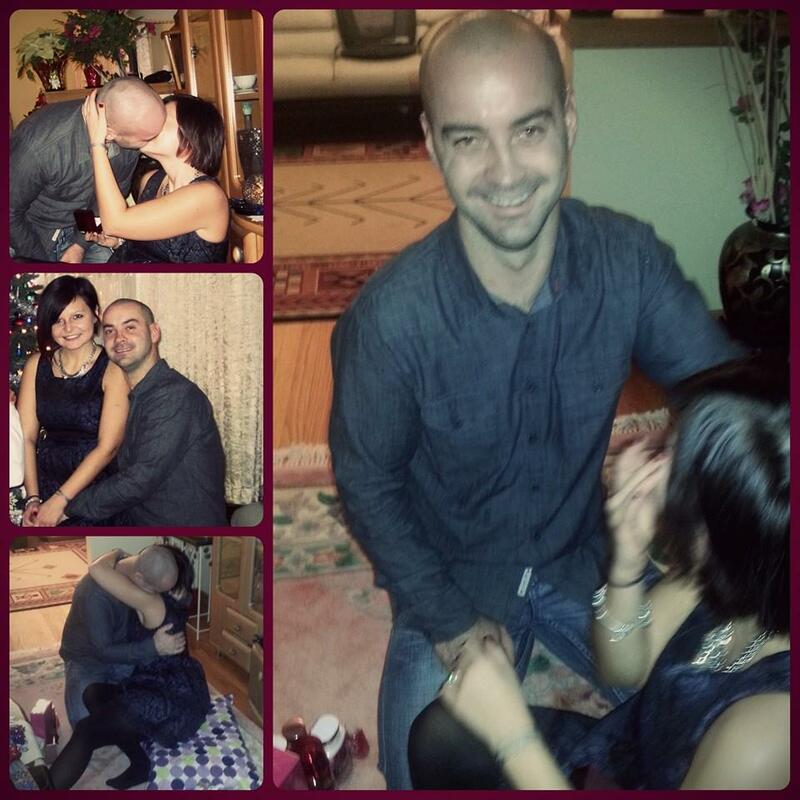 Bartek proposed to me on Christmas Eve of 2014, the most memorable and cherished moment of my life. It was an absolute surprise to me. As a Polish family, we open presents on Christmas Eve and the ring was actually the very last present that I opened. I was so excited to open my Kindle that I didn’t even expect anything more. The best part is that the whole time I thought my court side tickets to the Bulls were going to make this Christmas extra special for him. I was surely wrong. Take note, I don’t admit to being wrong very often! We celebrated throughout Christmas and New Year’s. As the holidays dwindled down and we all returned to our daily lives, what were we to do now? Of course, a future bride and groom must enjoy every moment of the engagement. Enjoy the many congratulations and every bride must appreciate all the times that every girlfriend asks to see the ring! Though it will get repetitive, enjoy telling the world how he proposed. Us girls love those stories! We can’t watch Lifetime movies or The Notebook at work so we want to hear all the details! While you enjoy, the next step is to talk to your fiancé about the future. Discuss whether you want this to happen in the near future or years down the road. Communication is key and planning together is necessary. Bartek and I would have gotten married the next month if it was possible! We picked to get married by the end of the year so planning went full force! Once you decide on a time span, decide on an approximate date. Eliminate any dates you definitely don’t want to get married. For example, we did not want a summer wedding as the Chicago humidity is not something we wanted to endure. As we chose the month of October, we immediately eliminated October 31st as this is Halloween. After you pick an approximate wedding date, discuss wedding venues. If you plan getting married in the near future and know of a venue you absolutely love, call them immediately and inquire what dates they have available. We knew we wanted a traditional Polish wedding at a Polish banquet hall. Though we live in Chicago and the Polish population is ginormous here along with the amount of banquet halls, our desire to get married in less than a year definitely eliminated many reception sites as couples plan years in advance! (In a future post, I’ll help those Polish brides in the Chicago area with some recommendations). As you are discussing dates and venues, you must begin that awkward financial conversation. This may decipher when your wedding can take place or just the general size of your wedding. Make a budget and stick to it, decide how much you are willing to spend on the most important day of your life as a couple. You may be willing to spend an arm and a leg or you may be a couple that would rather spend that money on your future. The important thing is to have this conversation with open communication, listen to one another and appreciate that you are in this together now. If you have gone to a wedding and fell in love with the venue, good for you! If you are my Bartek and have only attended a wedding or two, begin calling those banquet halls and setting up appointments to see them. I did a thorough Google search of Polish banquet halls in the Chicago-land area, made phone calls, took recommendations from friends and grabbed my mom to the appointments. Ask your fiancé if he wants to join! Planning is fun and can bring you together as a couple. This is the most important thing you’ll plan together to begin the rest of your lives. Take pictures so you can remember everything or so you can show your future husband. At your appointments, have a list of questions to ask that are important to you. My first question always revolved around the food as to us that is one of the keys of a good wedding reception. If the bar is most important to you, ask what types of alcohol they serve. Find out how long you can be in the building, if you can bring in your own decorations, what the decoration options are, if they have a bakery they use or if they can even bake your wedding cake in house, what the maximum amount of people in the hall can be, if there is a fee for slicing the cake, how much the chair covers or table cloths will cost, the various dinner options, how much a plate for children is, etc etc. There are numerous blogs and Wedding checklists out there with lists of what to ask before you sign that intimidating contract. Upon signing that contract, call your church and see if the same date is available. If you have a band or DJ that you must absolutely have, call them too and see if the date is available. Some couples may love a photographer and will circle their wedding completely around their available dates. If there is someone in your mind that is required at your wedding, call them and ensure they have that wedding date in your mind available. As you book your reception place, ceremony location (which may be the same), entertainment, florist, photographer and videographer – take a deep breath. Now that you have all the big things out of your way, enjoy being engaged! Book an engagement session, wear matching outfits and run through the meadows holding hands!